Yoko Ono just amounced the recipients of the Courage Awards in the Arts. Nabeel Abboud Ashkar is a Palestinian violinist in Israel’s Divan Orchestra, a teacher and the director of Polyphony. Polyphony is a programme designed for teaching young Arab Israelies to play high quality music. After finishing university in Germany, he moved home to Nazareth and founded the Barenboim-Said Conservatory . He had a vision to provide the highest professional musical training for young Arab kids in Israel, where the Arab minority make up 20% of the population. He explains that even among 1.5 million citizens, there had never really been any opportunities to start proper music schools in the region. He wanted to find the most talented students around Nazareth and provide them with the best teachers and education possible. He realised he would have to bring teachers from Tel Aviv and Jerusalem, however these cities are some distance from Nazareth. As soon as he called several musicians in Tel Aviv and told them about it, he recalls that “it took them 2 seconds to say yes.” This is how he ended up bringing the best young Israeli Jewish musicians to Nazareth to teach Palestinian kids. Martha Wilson founder of Franklin Furnace (www.franklinfurnace.org). It is an archive for artist books and variable media and was one of the biggest collections of artist books in the United States. The organisation advocates and supports under valued and little recognised artists books which are often overlooked by large art institutions. The majority of the collection has now been acquired by the Museum of Modern Art in New York City. Franklin Furnace held performances, exhibits and installations in Lower Manhattan and later in the Financial District of New York in the 1970s-1990s. It’s currently housed in the Cultural District of Brooklyn. Through Franklin Furnace, Martha Wilson has nurtured the artists Willie Cole, Jenny Holzer, Barbara Kruger and Ida Applebroog and many others. She has also introduced Eric Bogosian, Karen Finley, Annie Sprinkle and Paul Zaloom to the performance art scene in New York City . 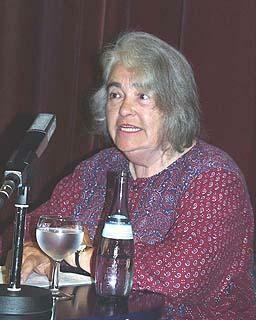 Kate Millett is a feminist author, artist and sculptor. She was the first American woman to be awarded a first class honours degree from St Hilda’s College Oxford. Her books include Flying (1974) and Sita (1977). In her book Going to Iran Millett describes her t Iran in 1979, where she aimed to campaign for women’s rights and unsurprisingly she was soon deported as a result. She describes her experience, of being incarcerated in psychiatric facilities in The Loony-Bin Trip (1990). It also addresses her being diagnosed as “bipolar”, and her decision to discontinue her medication. She won her own sanity trial in St. Paul and together with her lawyer she changed the State of Minnesota’s law regarding the commitment of psychiatric patients. Sabine Breitwieser is the chief curator of Media and Performance Art at New York’s MOMA (Museum of Modern Art). An Austrian, Sabine has a doctorate in law and previously curated the Generali Foundation, a contemporary art museum in Vienna. Her colleague, Jenny Schlenzka, from Berlin, is assistant curator for performance at the MOMA. Other installations currently on display include the recently aquired video installation, “9 Scripts from a Nation at War” dealing with the 2003 US invasion of Iraq. In order to stage these politically sensitive installations, Breitwieser and Schlenzka were able to persuade the politically conservative trustees of the MOMA of the importance of this work. Carolee Schneemann is an American visual artist. Her work focuses on discourses on the body, sexuality and gender. Her work is primarily characterized by research into visual traditions, taboos, and the body of the individual in relationship to social bodies. She expresses herself mainly through film, writing and paintings. Schneemann has taught at several universities including the Rutgers University, where she was the first female art professor hired. Additionally, she has published widely, producing works such as Cézanne, She Was a Great Painter (1976) and More than Meat Joy: Performance Works and Selected Writings (1997).